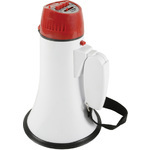 A compact megaphone with folding handle and wrist strap for ultimate portability. Announcements are amplified from the integral rear microphone up to 10W output with a loop player/recorder for automated announcements. Easy to carry and store yet capable of delivering impressive sound projection. 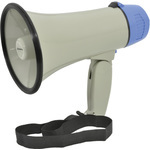 A compact lightweight, but powerful megaphone. With its built-in 10W amplifier, sound can be projected up to 600m in ideal conditions. 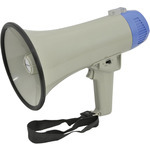 The megaphone also features a good quality built-in microphone, comfortable pistol grip handle, rotary volume control and a short carrying strap. 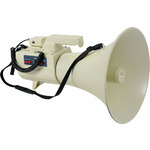 A powerful and durable pistol grip megaphone for outdoor voice reinforcement applications. Power : output - 30W max. PA horn speakers with 100V transformer offering several different power settings. The housing is moulded from high impact ABS material to offer maximum protection against physical or weather damage. Reflex loading and a rectangular flared aperture ensures efficient and directed sound delivery over large areas. 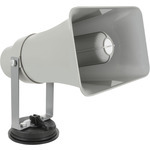 Active horn speaker with adjustable bracket and removable suction cup base for attaching to a vehicle roof. Power is connected via a 12V cigar lighter lead, delivering up to 25W power output. A detachable handset houses a push-to-talk microphone along with all controls and connectors for other functions. The top of the handset has ports for USB and SD media to allow audio playback and a 3.5mm auxiliary line input for external audio sources. An integral record function enables a speech message to be recorded up to 120 seconds and played back as a loop. Siren and whistle alerts can be activated by push buttons. 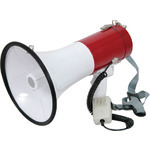 Designed for mobile announcements or permanent installation for public address or alerts. 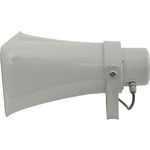 A large 50Wmax megaphone with 340mm spun aluminium flare and carrying handle. Can be operated free standing on rear legs or shoulder slung with the included strap. 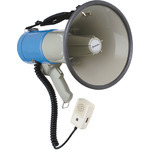 Alternatively, the megaphone can be mounted onto a stand via an 8mm threaded socket in the top of the flare. The rear panel is home to a USB/SD player with 3.5mm aux input and a latched cover for the battery compartment. 3 latching buttons control on/off, USB/SD and siren buttons and a non-latching button controls the whistle, all governed by a rotary volume control. A hard-wired clip microphone is provided with talk button and volume control or alternatively, a separate microphone can be connected to the 6.3mm mic. input. The most important feature is the power output, which can project sound as far as 1.5km, making this a serious product for announcements, event management and crowd control.